Texas Longhorns guard Isaiah Taylor (1) leads a fast break off of a steal against Texas Tech Red Raiders guard Robert Turner (right) during the second half at the Frank Erwin Special Events Center. Texas beat Texas Tech 67-64. AUSTIN, Texas (AP) — Cameron Ridley made two free throws and a big defensive play in the final 35 seconds, sending Texas to its first Big 12 win of the season Saturday night. Texas trailed by one when Ridley altered a shot and hustled down the floor for an offensive rebound before he was fouled. His two free throws put Texas ahead 65-64 with 31 seconds left. Texas Tech had a chance to win. Jaye Crockett missed a jumper. Jonathan Holmes grabbed the rebound, then made two free throws with 1 second left. Texas (12-4, 1-2) desperately needed the win. The Longhorns started 0-5 in conference play last season and never recovered, tailing off into the program’s first losing season in 15 years. A similar start might have doomed coach Rick Barnes’ rebuilding project. Isaiah Taylor scored 14 points to lead Texas. Crockett and Robert Turner each scored 19 points for Texas Tech (8-8, 0-3). Texas had three starters, Holmes, Ridley and Demarcus Holland, play just eight minutes or less in the first half because each picked up two early fouls and totaled just three points before halftime. Turner scored nine in the half for the Red Raiders, who led 33-32 to start the second. Ridley, Holmes and Holland started the second and made an immediate impact as the Longhorns cleaned up their foul problems. Holmes and Ridley scored Texas’ first seven points of the second half and Taylor’s floating layup put Texas ahead 41-40. Texas threatened to make a run when Taylor converted a tough layup, then sent a nifty backward pass to Kendal Yancy on a 3-point play. 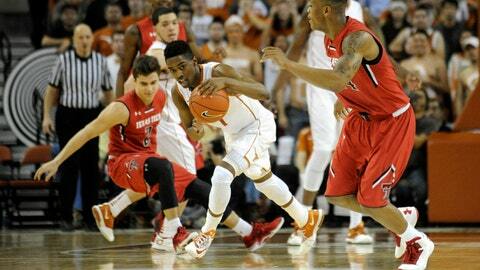 Javan Felix made a 3-pointer from the right wing and Texas led 50-42 with just under 13 minutes to play. The Red Raiders wouldn’t let Texas break away. Jamal Williams made a 3-pointer and Turner’s layup pulled Texas Tech back within three. The game stayed close the rest of the way and Turner’s two free throws with 1:19 left gave Texas Tech the lead. The loss will sting the Red Raiders, who had their chance to end a 15-game losing streak to Texas in Austin, a skid that dates to 1996. It also would have been a nice return for first-year Texas Tech coach Tubby Smith, who was fired a day after the last time he led a team to Austin. Smith guided Minnesota to the NCAA tournament last season, but the Golden Gophers lost in the third round on Texas’ home court and Smith was fired.